This weekend, New York City got its first snowfall of the season! Yes, I still get excited about snow–I think it’s my California upbringing, largely without snow or winter white Christmas days, that keeps my enthusiasm for freezing precipitation alive! So for about a day, I enjoyed the gorgeous blanket of white that covered the city before the accompanying bitter cold and treacherous ice made me miss the warmer west coast winters. This Christmas, I had the fortune of spending some quality family time in the Bay area. A place where you don’t have to worry about layering winter coats, and can instead wear short-sleeved shirts! 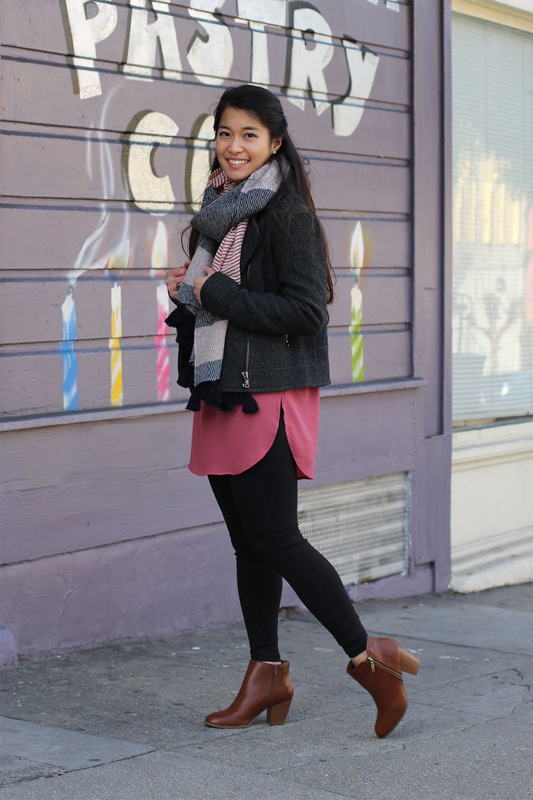 On one of our walking days, I wore this city-chic outfit featuring functional layers from Ann Taylor and Loft, and super comfy booties that I could walk miles in… literally! So here’s my first pro-tip of the year: when exploring a new city or neighborhood, make sure to wear a trusted pair of shoes! 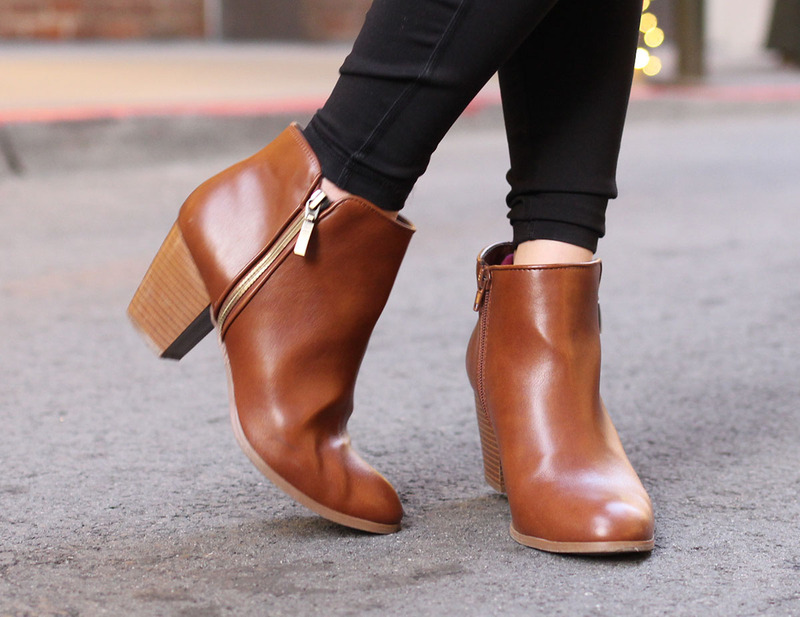 These cognac-colored chunky-heeled booties are the perfect intersection of fashionable and function! Firstly, they’re stunning to look at. Made with quality materials, the booties look far more expensive than they actually are, which to me is always a plus! Secondly, they are comfy, comfy, comfy! I could (and have) walk for miles in this without feeling achy. The booties’ chunky heel gives my petite self some height without holding me back or giving me sore feet. As proof, my outfit shots here were taken in three different San Francisco neighborhoods within the same day of my walking tour! And let’s give myself some credit here… San Francisco streets are no joke. Those hills and inclines?! Yup. Long story short, I absolutely adore these booties. Once the ice melts away from the NYC sidewalks, I can finally wear them around again! In the meantime, I’m doing what I can to stay warm and I’m hoping the same for you, wherever you may be! As always, thank you so much for stopping by, for your readership and support. It means a lot to me especially as we start 2017–drop a line and leave me YOUR thoughts on your favorite city-chic outfit tips (or anything else!) in the comments below. Stop by again soon!